Hi aspirants we have seen so many are struggling to solve Seating arrangement, actually it is one of the important, logical and easy topic in the on going SBI, IBPS, other banks PO, clerical and Competitive exams. Anyone can score if you just remember these tips we specified below. No matter what the model is, the following points are to be noted in order to solve the questions easily. 2. Identify the statements that give definite information. Statement (a): A is to the left of B. The data in the statement is basic but not definite as the statement ONLY says that A is to the left of B. but, it does not specify where A is located from B. Statement (b): A is second to the left of B. The data in the statement is definite as it clearly states that A is placed second to the left of B. Statement (c): T is between Q who plays football and P in order of seating in a row. It can be understood as 'T is between Q and P. So, they may be seated as QTP or PTQ (so, the data is not definite) and 'Q plays football'. 3. Search for the connecting information. 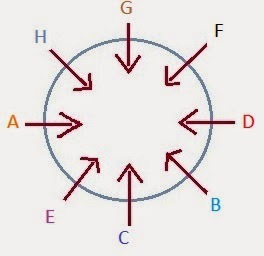 A, B, C, D, E. F, G and H are sitting around a circle facing the centre. a) E is to the immediate right o A, who is second to the right of G.
b) D is not an immediate neighbour of C or H.
c) F is third to the right of C and second to the left of H.
The statement (a) says: E is to the immediate right of A. A is second to the right of G.
The statement (c) says: F is third to the right of C. F is second to the left of H.
Normally, we will be tempted to solve the question by picking up point by point from first. But, that is not correct. We should be careful in selecting the points to solve the puzzle by searching for definite information. Here, though (a) and (c) are definite points, we have to pick up (c) first as this point is connected to the point (b) (as 'C' and 'H' are discussed in both the points). In case, we take point (a) it is difficult to solve the question. If the sum is regarding 12 members sitting in parallel rows how would we solve it. Can you help me with regarding this type of sum. Similarly again place 'F' which is 3rd to the right of C, you will start counting in Anti-clockwise direction from C.
Does this cleared your confusion?. What a great article, i am searching for this many days, but did not find any great way, but my search came to an end after visiting your website. Can you share some more for preparation. How to sit person clockwise or anticlockwise direction? What is its sitting rule? Please clear my doubt. 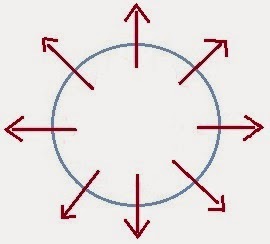 How to solve circular puzzle with profession and gender? how to start puzzles having inward outfard facing direction in circular arrangmnt? How to solve puzzles in less time ? In ibps po pre time is less and whenever I try to solve any puzzle it is taking a lot of time. Also if I leave it I m getting less marks because I am not good in maths. So need to solve more of reasoning section. Please guide to do such problems in less time. TYSM!! It helped me a lot.. Thank you so much,It helps a lot. Can you please tell me How to solve puzzles quickly? Can u help me in understanding input output concept in reasoning..
Can you explain circular seating arrangement puzzles in which one sits towards the center and another sits away from the center? thanks for your valuable support sir.but i have found difficulty in two layer circular arrangement puzzle...plz provide how to solve two layer circular arrangement puzzle. you're asking me to help you in arranging their positions? Is there anything else bothering you? hi first of all tips r good..but want some more tips for sitting arrangement for some facing outside n some inside in a circular arrangement as well as in a two row concept if there r lots of things given example persons like colors as well as their profession..i hav given ibps po mains recently n got stuck with 3 of the tricky puzzles. hi i also face the same problems like anupriya and i also want these type of questions which contains puzzle questions with blood relations involved in it. i have a question rather say it as a confusion. is there any difference between A IS LEFT OF B and A IS IMMEDIATE LEFT OF B. If you don't like it just leave don't waste my time and your valuable time on giving unnecessary advices (which are mere a waste of time to give reply for me too). Helo mam ..i have a problem in one sum..can u plz explain it with the help of diagram. Miss B sits right to the barber. The washerman is on the left of the tailor. Miss D sits opposite mr. C .
hello mam...plz suggest how to solve a puzzle in which 2 directions are there. Very helpful ...can you please show some guidance on problems related to people on different floors. Very helpful information given by you please remain guide us in every step thank you. Hi. A.B.C.D lives on different floors. A lives in 1 floor n likes black colour.........to which chapter does this problem belong to. 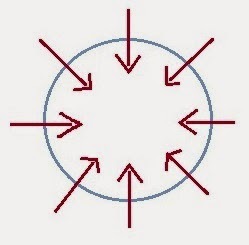 Eight friends M, N, O, P, U, V, W and X are sitting in two circles in such a manner that each member of the inner circle sits exactly opposite the member of the outer circle. The members sitting in the outer circle are U, V, W and X and all of them are facing towards the centre while the members of the inner circle are M, N, O and P and they are facing away from the centre. Each of them likes a different colour, viz Red, Yellow, Blue, Green, White, Black, Orange and Purple, but-not necessarily in the same order. P likes neither Yellow nor White and faces W, who likes neither Black nor Purple. The person who likes Orange faces the person who likes Red. M, who likes Green, faces the immediate neighbour of the person who likes Blue. W sits second to the left of X. The persons who like White and Red are in separate circles. The person who likes Black sits on the immediate left of X. V, who does not like Blue, does not face M.